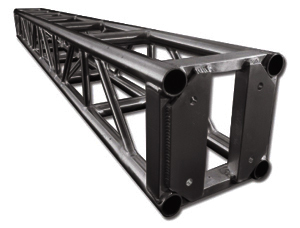 All of STAGECMDR’s truss inventory is plated box truss manufactured by Tomcat USA. Tomcat is one of the industries leading truss manufactures and is in our opinion the “Ferrari” of lighting truss. Bolts & nuts are included in rental. Black truss is used to blend into natural surroundings and can be used for many different applications such as weddings or events where the lighting equipment and truss is to be hidden so that the focus of your event attendees is not drawn to the theatrical equipment. 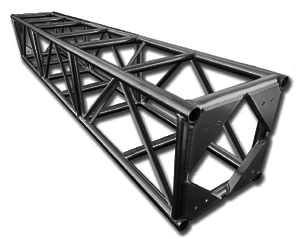 STAGECMDR has the largest black truss inventory in its local market share. Black 5 way corner block for 12″ plated box truss. Silver 5 way corner block for 12″ plated box truss. Black 5 way corner block for 20.5″ plated box truss. 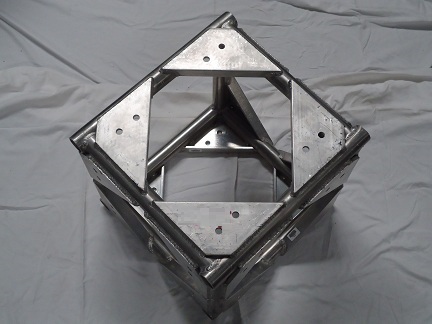 Silver 5 way corner block for 20.5 – plated box truss. Hinge book style corner for 20.5″ plated box truss. Tomcat truss floor base, 30×30 inch, silver. 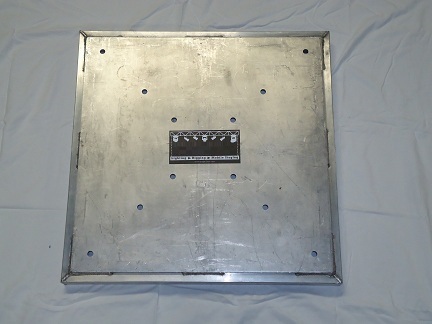 It can be used for both 12″ & 20.5″ Tomcat plated box truss. Perfect for making light towers with either black or silver truss. Bolts/nuts included in rental.